It was only six months ago that Grovo launched in the first place. The online service provides a wide variety of training videos and tutorials to teach people how to use social media and other online tools. Now, Grovo has undergone a significant overhaul, and has launched anew with a slightly different business model. When Grovo initially opened its doors, it used a credit system based on a "friends and family" approach to let users earn credits to view training lessons. Users were given five free lessons for signing up, and an additional five free lessons for every contact they invited to join Grovo as well. That model has the potential to generate some buzz and attract users, but it also has the potential to turn users off and make them avoid the site. For Grovo 2.0, the "friends and family" model for earning lesson credits is gone. The Basic Grovo content is simply available for free. Period. Want to know how to set up an automated Gmail response when you're away on vacation? Are you wondering how to use Mint.com to set up and maintain a budget? Tutorials to walk you through answers to those questions, and hundreds of others are available for free. Grovo has more than 400 lessons covering dozens of sites and services ranging from Amazon to Zillow. 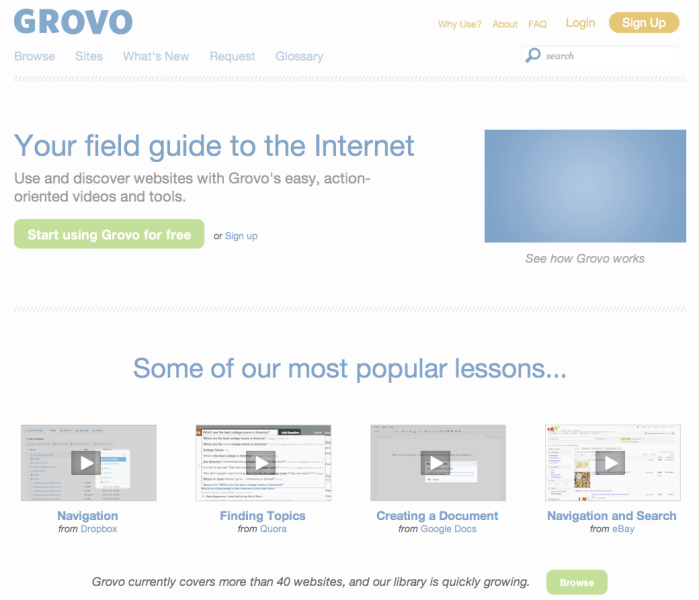 The content is created and produced in-house by Grovo, and is expected to grow to more than 2,000 lessons by 2012. The Basic content can be embedded on a site or blog, posted on Facebook, Tweeted out and otherwise freely shared with friends and contacts. With the reinvented Grovo, though, there is also Premium content. The Basic content is aimed at consumer-level training that teaches average users how to do basic things on sites like Twitter and Facebook, or using services like Gmail and Dropbox. The Premium content, on the other hand, is aimed at business customers that want to understand how to do more advanced online tasks like online marketing and ecommerce. A Grovo press release explains, "For a monthly fee of $19, or $190 annually, organizations can gain unlimited access to advanced training and business content in the areas of Productivity, Online Marketing and Social Media. Grovo's Premium content provides in-depth, ongoing training on the sites and applications organizations use most." Next time your Mom calls you to ask how to find and follow users on Twitter so she can keep up with Charlie Sheen's crazy rants--send her to Grovo. Next time you want to know how to build and promote a Facebook Page for your business--consider the Grovo Premium content.